Tiny plant cells, known as dinoflagellates, that live within coral tissue can help to regulate the osmotic pressure in corals to better cope with a highly saline environment. 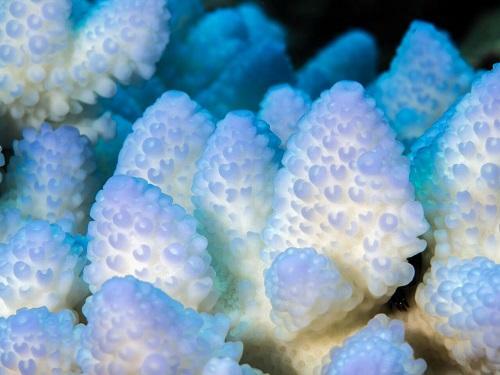 KAUST researchers suggest this may be one of the secrets of corals from the Red Sea and Persian/Arabian Gulf, which are extremely tolerant of heat in extraordinarily salty waters. Coral reefs have high biodiversity and economic value, yet these vital ecosystems are at risk as rising sea temperatures increase the frequency of local and global coral bleaching events. KAUST researchers are searching for strategies to help reduce future reef loss. "The effects of temperature and pH changes are intensely studied; however, the implications of climate-related salinity changes on corals have received little attention," explains PhD student Till Röthig, who led the paper with postdoctoral fellow Michael Ochsenkühn. "The synthesis of COOs represents a quickly available and viable long-term solution to establish an osmotic equilibrium," explains Röthig. "Our research demonstrates that the COO floridoside is used as a conserved osmolyte to help Symbiodinium and corals to osmoadapt to the saline conditions." "ROS are produced under salinity stress, but are also produced under heat stress where they can cause coral bleaching," explains Voolstra. "Thus, the same molecule that adjusts the osmotic equilibrium and protects the dinoflagellate and coral from stress from high salinity may inadvertently contribute to increased heat tolerance due to its ROS scavenging properties." Knowing how salinity changes impact corals has important implications for management especially considering the effects of climate change," says Röthig. "For example, suggested transplantation of temperature-resilient corals from the Red Sea to other habitats may not confer the desired temperature resistance in a new, less saline environment. Conversely, increases in seawater salinities in some places may help corals to become more stress tolerant."